How the fears and anxieties of each generation are passed on to the next. In high school, I was one of those kids you probably loved to loath. You know, the one who grabbed a front-row seat and every time the teacher asked a question waved his hand so manically that he was practically screaming, me, me, call on me! But truth be told, amid all the things that made me unhappy in those years, school — actual schoolwork — wasn’t one of them. Yes, I was confounded by the math problems in which the current of a river flowed at one speed and a boat was heading the other way at a different speed, and a few more bits of weird information were tossed into the eddies and you were supposed to do something with it all. But generally speaking I enjoyed school. I liked my teachers — at least the ones who challenged me to think or, as we would start saying only a few years after I was out of high school, "blew my mind," the ones who seemed to bend the world in interesting directions. I liked to learn. I liked to read by myself in my room. I went to the local library regularly and came home with piles of books. I was a dino-nerd (with the American Museum of Natural History’s T. rex on the brain), and a Civil War nut (no Bruce Catton volume went unread) with a sideline in advanced sci-fi. And it being the 1950s, I harbored the sort of nuclear fears that you barely thought about and didn’t really speak about, but that, in my case, appeared repetitively in unsettling dreams in which I found myself wandering through an atomically devastated world. I was, above all, fascinated by history, in part perhaps because my parents were of a post-immigrant generation in flight from their past. Undoubtedly, that fascination represented an early, particularly nerdish form of rebellion (not that anyone noticed). Perhaps it was also comforting to nail myself into a narrative of American life in those years when the past, as my parents and so many other Americans saw it, was hardly worth thinking about, not when the future was so promising. But let me hasten to add that not every class in high school thrilled me. There was, for instance, my American history teacher. He was a grey-haired ancient (though undoubtedly younger than I am now) who had, we kids then assumed, been passing news of the New World on to students since at least 1776. He must once have been inspirational, but by the time I came along he was lecturing off ancient notes on yellowed paper. I used to imagine those notes dissolving into a cloud of dust with the first gust of wind through the window by his desk. I was then teaching myself a version of American history at home at night and I couldn’t have found the daytime version less impressive. but cars of the workmen, too. machinery to own and ride around in. I’m sure history texts are just as uninspiring today, but in different ways. After all, I was living then in the American Age of Steel, so long gone that — who can remember? Recently, going through some old files, I stumbled across an artifact from the ruins of that era. A map I had made on a single piece of white paper hidden inside that very history book, open-faced on my desk while I fiddled away my time, bored out of my gourd, barely listening to our teacher drone on. That document is as much an artifact of a lost world as the poem, but far more complex and confusing. It’s an elaborate document, including an inset key that tells you how to read the various markings I used (“original territory of China & her armies,” “routes of invading armies,” “counterattacks,” “conquered territory”). This was serious stuff! In order to indulge my fantasy history of a future world, however, I had to deal with one obvious problem of that moment: the possibility that any war could become a nuclear holocaust. Remember, I was part of a generation of kids who grew up ducking under our desks while air raid sirens howled outside as, with our teachers, we practiced for Armageddon — for what to do if the Russians nuked New York City. To fight a global war of conquest, the Chinese of my imaginary universe, who then had no nuclear weapons, would have had to face a massive American nuclear arsenal. Hence, in an otherwise blank mid-Pacific, I drew a crude mushroom cloud captioned, “Atom blast destroys Pacific Isles & U.S. missile supply” (i.e. the ability to get nuclear weapons aloft). I evidently wasn’t thinking about the Strategic Air Command or the already existing Russian arsenal, but, hey, give me a break: I was 15 years old and my teacher was droning on. That mid-Pacific blast was a small reminder of how difficult it was, even in my fantasies, to imagine World War II-style battle scenarios in a nuclear age. It was, believe me, a confusing moment in ways just about no one bothered to put into words. Not surprisingly, the children of that era, experiencing the pride of parents who had returned victorious from a world war and the fear of ultimate annihilation that the war’s most wondrous weapon had engendered, were in their own ways as unsettled as the adults. The question of whether to use triumphal weapons of a suicidal nature to accomplish national ends was a new and confounding one already being played out in the movies kids could see, even if transposed to other planets or alien beings. After all, contemplating future “global wars of annihilation” (as America’s top strategists called them in private communications with each other), you could either forswear meaningful victory by not using your nuclear arsenal or you could strike first, by surprise, taking on the uncivilized and treacherous role long reserved in American lore for the enemy. 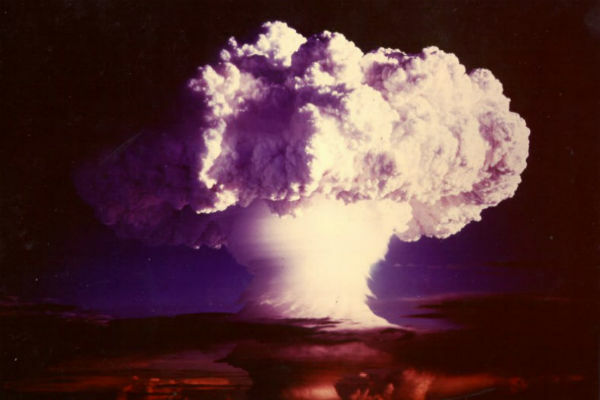 In secret directives, the “wise men” who inhabited the upper levels of Washington policymaking circles then were already planning for the possibility that 100 atomic bombs landing on targets in the United States would kill or injure 22 million Americans, and that an American “blow” (i.e. surprise nuclear attack, or “first strike”) might result in the “complete destruction” of the Soviet Union. No wonder in my own planning I had to remove atomic weapons from the equation, leaving me with a less daunting task than visualizing extinction with penciled marks on a map. My approach to the fighting was otherwise traditional — hundreds of tiny arrows winging their way through the boredom of my history lesson and over every land mass from Greenland to Australia. It was clearly a task meant to occupy not one class, but days of classes. To reach the United States, tiny arrow by tiny arrow, my imaginary Chinese invaders had cross the Bering Strait, meet up with another army routed through Greenland, and then sweep down on my home. (The un-American word “homeland” would not make it into the language for another 42 years.) According to that 1968 date, I would have been 24 when I became a “Red Chinese” subject. Today, I look back at a boy I can barely remember from 50-plus years into a future he had no way of imagining, though even he knew that the Chinese would never conquer the world. It’s hardly surprising, in that era when fantasies of enemy invasions and communist takeovers sprouted unchecked, that an adolescent, even from a liberal New York City family, would have absorbed the mind-set of his society. And so it’s no shock that my map of that moment did, in fact, trace a horror story that would soon obsess Kennedy-era officials like Secretary of State Dean Rusk and military adviser General Maxwell Taylor, who believed Chinese “aggression” and “expansionism” presented dangers not just for Asia, but for the world. Yet, as with all ancient documents written in languages no longer easily decipherable — as anyone knows who has ever followed the tale of the decrypting of Linear B, the lost language of ancient Crete — you have to be careful how you interpret the markings of another time, including those on my map. One thing I still know about it, however, is that it was something more than a child’s version of Cold War fantasies and fears. To make that map in a class presenting an idealized view of state and citizen, to make it inside a textbook whose dedicatory spirit was embodied in an ode to the American car, constituted a barely conscious act of opposition. It’s not simply that the map amuses me today, but that it amused me then. At the time, I found secret pleasure and entertainment in playing with and elaborating a version of the worst nightmare the anti-Communist mind could produce: the Commie conquest of the world, the idea that hundreds of millions of “blue ants” (as the Chinese were then often labeled) might be in charge. I was, that is, sitting in that classroom playing enjoyably with the worst that could happen to an American world short of absolute global extermination. Like so many other adolescent acts in those years, that map was an affirmation of its moment, but also a corrosive gesture toward it. With every arrow, a bit of another country fell not to an American version of what I once termed “victory culture,” but to a darker culture of defeat. It was an act of faith, but also of mockery. Representing horror and yearning, that map said: this is what it would be like if your vision proved true — and wouldn’t that be something! Part of the secret world of my childhood, that map prefigured a far more unnerving and oppositional future than I could have imagined. Only a few years from the moment I sat in that classroom, radical students, recently made aware of a horrifying American war in a country called South Vietnam, were producing a map that went far beyond my ambiguous product, but was related to it. In that 1965 map, which appeared in the National Vietnam Newsletter, “enemy-occupied areas” of Vietnam turned out to be those occupied by the United States and its South Vietnamese allies. Here was the thing: the boy who made that map was part of the first generation of American children to face the possibility of human extinction at our own, not God’s, hands. It was an obliteration that could be brought about by a bunch of no-good Commies, Ruskies, Reds, but also — as the real world would bring home to us on October 22, 1962 — by a group of sober American strategists, by, that is, the good guys. That strange amalgam of faith and mockery, of the American triumphalism those kids inherited from “the greatest generation” and a secret countercurrent of despair that lurked beneath it, burst into full-blooded life in the next decade, when kids like me took to the streets for a new sort of battle garbed in cast-off “good war” paraphernalia — secondhand Army jackets, bombardier coats, and bush hats, while sporting "V-for-victory” signs transformed into the symbol of “peace.” At the same time, in a spirit of mockery and without access to the media, the young reconceived the cherished images of their American childhood on themselves. They became distinctly modernist endeavors, living critiques or parodies of a familiar world gone mad, which in those years stood both for Mutual Assured Destruction (i.e. nuclear obliteration) and MAD magazine — or genuine worry and the “What, me worry?” of Alfred E. Neuman. The particular images the young sported then were drawn in part from the World War II era, but also from an enemy-ness recognizable from any of scads of westerns we had seen growing up: the Pancho Villa mustache, sombrero, and serape; the Native American headband and moccasins; the painted face or long hair of the “savage”; the valued “love beads” (those previously worthless baubles with which, everyone knew, Manhattan had so fraudulently been purchased); the peace (now, drug) pipe; and so on. In a continuous riff on the dominant imagery of their childhood, the young donned “body paint,” took on the aspect of the previous losers (as well as winners) in American history, and went on the peace path. At that moment, we were faced with a vision of that former democracy of cars, so lauded in our childhood, now reconstituted as a pre-Reaganesque evil empire and doing terrible things in a distant land. At the same time, we had spent all too much time in the company of an American leadership mapping the world’s end with a relish all their own. It’s hardly surprising under the circumstances that those kids, myself included, jumped into the abyss that had opened beneath our feet with a certain relish. We displayed our maps, the ones where the Chinese conquered the world, on our bodies, and headed into the streets to show them off. There was a relief, I have no doubt, in that mockery, in leaping feet first and enthusiastically into an abyss filled with some of the worst fantasies adults could conjure up, in rejecting the reigning American triumphalism of that moment and passionately embracing the despair that lay just under the surface. It was a matter of making the best of what seemed increasingly like a bad bargain. Little did we know! In 2014, half a century later and seven decades into a world in which humanity has figured out not one but two ways of ending its life on this planet — nuclear weapons and the burning and releasing of fossil fuels — in an America in which triumphalism is ancient history (except in the fantasies of the Republican right); in which education, formerly the royal path to the future, is increasingly the road to lifetime indebtedness and jobs a new form of peonage; in which oil company execs and oil state chieftains cook up energy-reserve recipes for total planetary combustion, I’m curious about something. What alternate worlds are today’s kids mapping out while their teachers drone on? Undoubtedly, whatever they may be, they're on screens of some sort, not pieces of paper, but what worlds of fear are those teenagers preparing to leap into in a spirit of faith and mockery so many decades later? In 2014, what strange pleasures — and horrors — can be found in rising adult fears in an exterminatory world? After all, 1959 was an exceedingly quiet year for the young. Who knew what worlds they were mapping out for their future? 2014 seems like a relatively quiet year for the young as well, but who knows what’s happening in that classroom? Who knows how the young of today are processing the nightmares of our present world? Who knows what maps the young of 2020 or 2030 will be displaying, possibly in the streets, possibly on their own bodies, possibly in ways none of us can imagine? Just don’t think for a moment that they don’t live in and try to grab life from the hell that we adults have created for them.